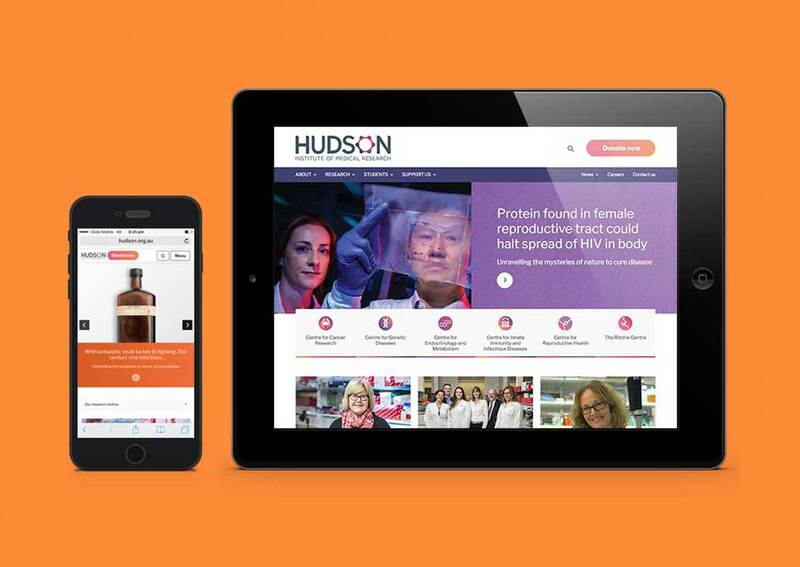 Hudson Institute is a leading translational medical research institute. Based in the Monash Health Translation Precinct in Clayton, Victoria. The Institute is comprised of 303 staff and 183 students, and 2016 saw 333 research publications and 69 diseases were impacted by their research. 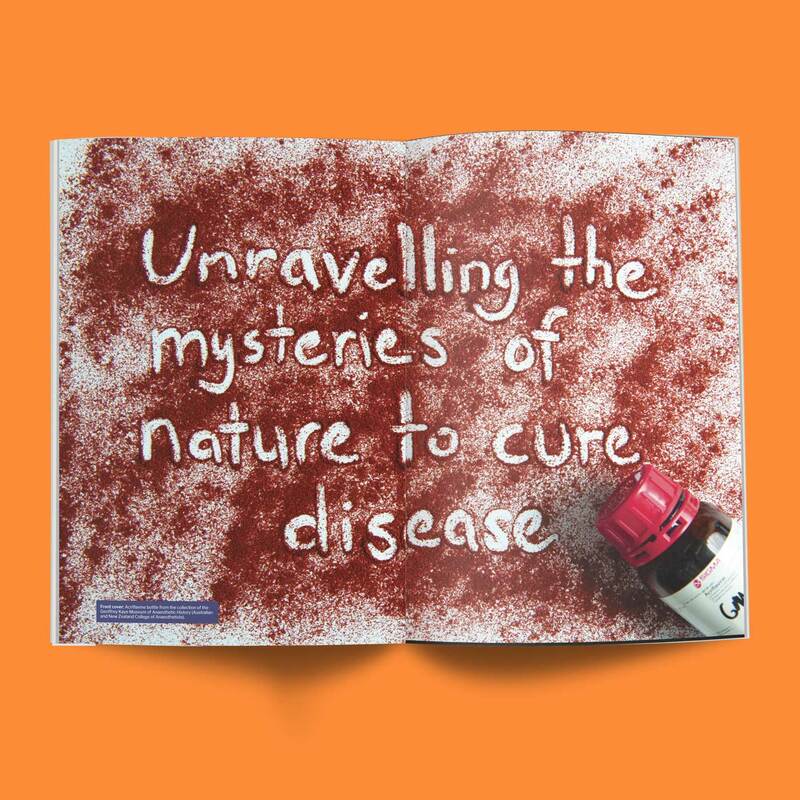 Some of the impacted diseases include lung cancer, HIV and brain tumours in children. 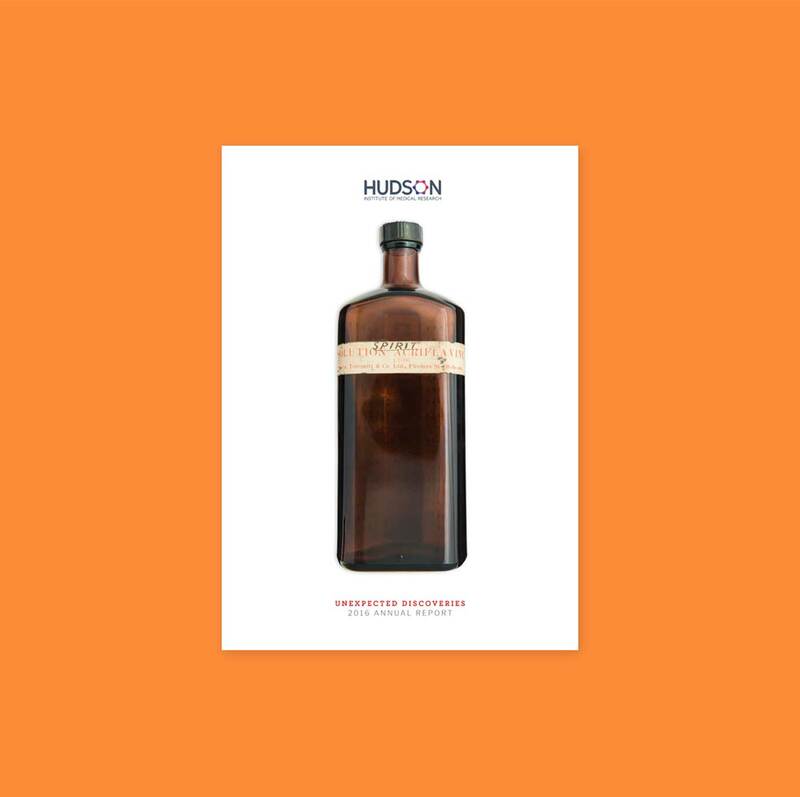 Needless to say Hudson Institute is a sought after leader in the industry, regularly featuring in the media for their break-through research. 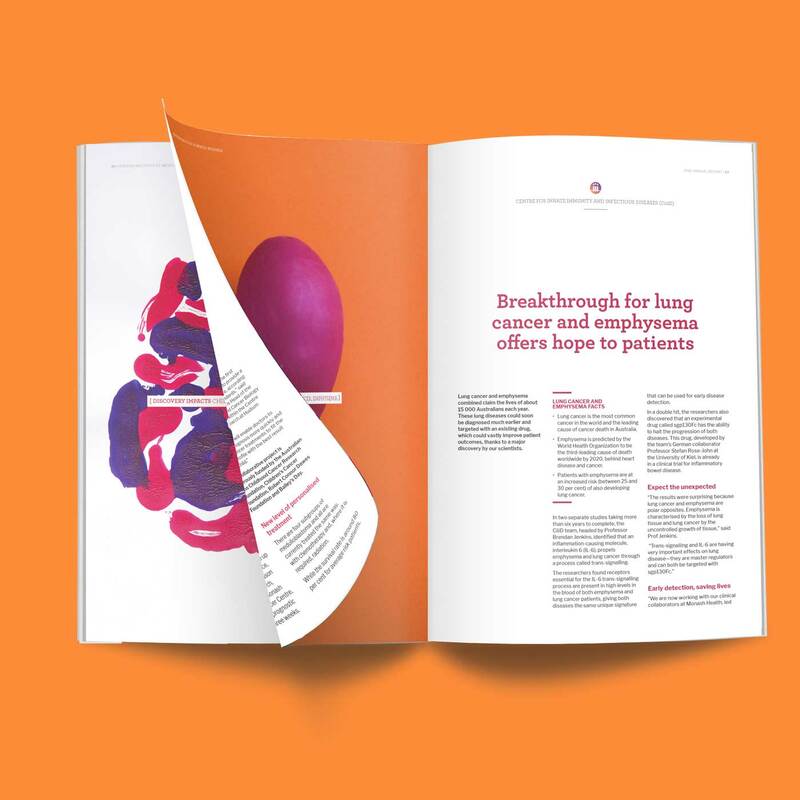 Unfortunately they had outgrown their old website and some of their marketing collateral, and needed an organised approach to updating everything. The Institute approached Jen & Ben Design to update their website and create new marketing collateral. The website needed to be easy to administrate as it is updated constantly with media stories, events, new staff and reports. There was also a lot of pre-existing, disorganised content, so this needed to be rearranged and housed for the Institue into a logical system. Finally, Hudson Institute rely heavily on donations, so it is important that donating is obvious and easily accessible. At Jen & Ben we believe beautiful design isn’t just for the public-facing side of the website, the back-end system for the content editor should be just as well thought out and designed. We sat down with the communications team at the Institute many times to ensure we correctly categorised and labelled their content. This was then combined with a planned and logical back-end system. Changing something would update it in various places on the website and would display it as needed for different sizes and contexts. 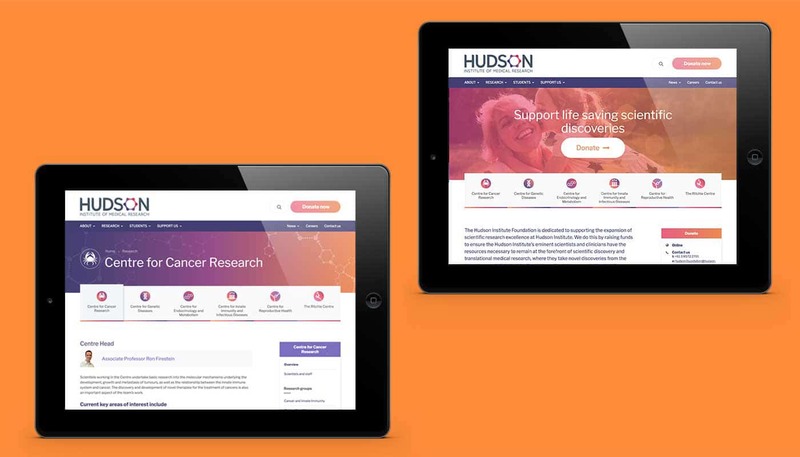 Minimal website training was needed, as the staff at Hudson Institute recognised their own language in the back-end, making creating new content and editing existing content intuitive. The new website places much more emphasis on the Institute’s Reseach Centres and fundraising. Our research and analysis showed that their research centres were highly trafficked, so they have more prominence on the home page, taking the user to where they often want to go in one simple click. We created several methods to make navigating through the content-heavy website easy for the user. This includes searching, secondary navigation, organising the order of content from the existing user traffic, and using intuitive cross-linking on all the pages. 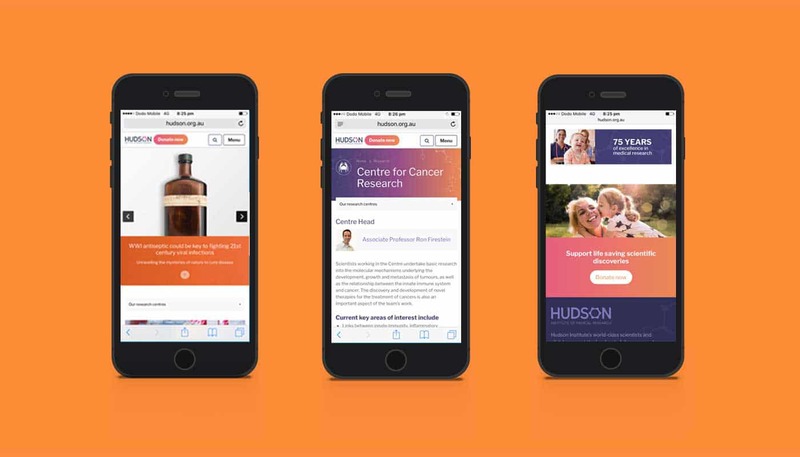 As an example, the Centre for Cancer Research’s page has automatically generated links to the head researchers and the research groups within that centre.